What is feminism and what is equality? Is there a connection or contrast between the two? These are some of the questions which have sprung into the mind of the budding young poet Chamodi Hewavitharana. Hailing from Katunayake, Chamodi studied at St Bridget’s Convent, Colombo, and Ave Maria Convent, Negombo. 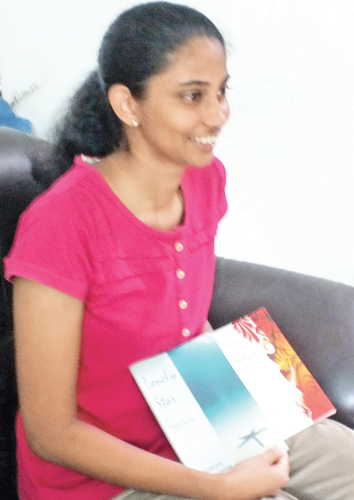 She completed her school studies in Bio-Science in 2018 and is yearning to become a doctor, following the foot-steps of her mother Dr Niroshini de Silva. Her father’s name is Supun Hewavitharana. Chamodi took to English Literature and tested her hand in writing poems and completed two poem collections ‘Lonely Star and Other Poems’ and ‘Summer Wind and other Poems’ while she was studying in the science stream. Both books are sold in the book stores across the island. She completed her first collection of poems when she was in Grade 8. She is now completing several other poem collections and has taken up the subject of feminism too. She notes that this issue has been there in history as practices like Sathi Pooja has been implemented. “In certain sects when the husband dies, the wife is forced to jump into the husband’s burning funeral pyre. Women who are culpable of adultery are stoned to death or beheaded in public in some rare cases, “she said.